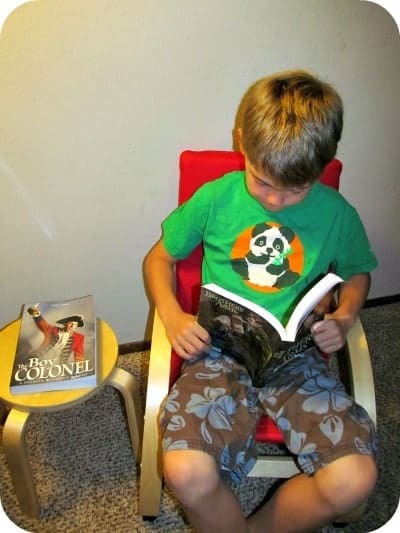 “Honey, where is Adam?” A few minutes later we found our seven year old son curled up in his bed reading, Brothers at Arms-Treasury & Treachery in the Amazon. He said, “Mommy, this is such an exciting book but I can’t read all the words so can you read it to me?” With that, my son and I spent the next week reading this exciting book together every evening before bed. The Men of Grit books are a part of a Christian Fiction Series for young men (and girls) that is proudly presented by Vision Forum. These adventure style historical fiction books are absolutely riveting (I enjoyed it as much as my son) and teach godly values to a young adult audience. In The Boy Colonel: A Soldier Without a Name by author John J. Horn, a young English solider is the commander of a regiment in Siberia. Set in 1836 “No one knows his history. No one knows his name”……….The young soldier must face enemies while performing his duty and make the difficult decision whether to follow his King or the God of the bible. Brothers at Arms: Treasure & Treachery in the Amazon is the second book by John J. Horn in this series and my son absolutely loved it. It includes everything appealing to adventure lovers including danger, secrets, chivalry and Christ centered brotherhood in the middle of the Peruvian jungles and mountains. In this exciting story, two twin brothers with little in common must learn to trust God and join together to face the enemy. I will be keeping these two books permanently in our family library so that my son can revisit these two stories when he is a bit older. I am very impressed with the quality and content of the Men of Grit book series and highly recommend for adventure seeking young men and women. It teaches important Christian values and has a rich depth of history that brings it to life in an entertaining yet educational way which I appreciate. You are invited to visit Vision Forum to purchase the two books in the Men of Grit Christian Fiction Series (only $25 for both books) or browse the entire selection of excellent Christian books, audio books and gifts for children and adults. These would make excellent Christmas gift ideas and is sure to be well received by the lucky recipient! P.S. Vision Forum always has excellent daily deals so be sure to sign up for emails so you don’t miss out on some exciting, money savings offers! Please Enter Me In Your Men of Grit Christian Fiction Series Giveaway. 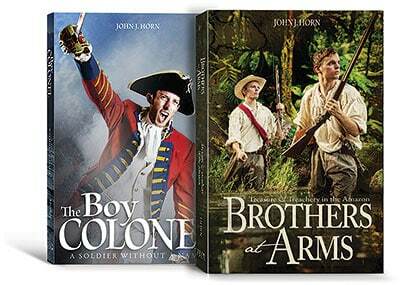 And Brothers at Arms:Treasure & Treachery in the Amazon By John J. Horn. and comment on another product that my family would enjoy. I Think My Family Would Enjoy The Pendragon: Sword of His Father And Milltown Pride DVDS. I would like the Christian and Homeschooling books. My grandson would love the soda geyser car. We would enjoy the Cowboy Dave CD. The Blue Floral Tea Set looks very nice!